Publication in 1888 of The Secret Doctrine with its comprehensive outline of the evolution of worlds and of man opened wide the gates of spiritual inquiry. Not only did it compel analysis of the religious and philosophic dogmas of past centuries, but it also stimulated the aspirations of thousands of people in all walks of life. 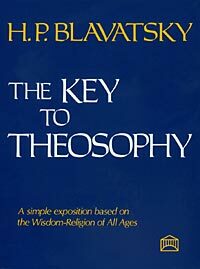 As a result, H. P. Blavatsky found herself deluged with requests for a simpler presentation of the ancient wisdom-religion. Her response was The Key To Theosophy. Written in the form of question and answer, this book unfolds in easily understood language the fundamental principles of theosophia or “divine wisdom” – a term in use, the author tells us, as far back as the third century of our era when Ammonius Saccas founded his Eclectic School in order to show the common origin of the “thousand tenets” of the many religious sects of both East and West. Seen as parts of a cosmic pattern, the themes of death and rebirth; fate and destiny, freewill, and karma; God and prayer, as well as the sevenfold nature of man’s constitution, reveal a practical and inspiring philosophy for everyday living. Book orders processed via Gazelle Book Services Ltd (read about Gazelle Book Services Ltd).